Glass Agencies EROSE are Manufacturer of Cabinet For Slide. DOLPHIN® INSTRUMENTS IS ONE OF THE LEADING MANUFACUTERE AND EXPORTERS. 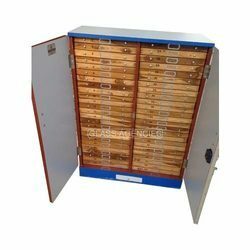 Owing to our years of industry experience and precise knowledge of this domain, we are offering an outstanding assortment of Microscope Slide Cabinets. The cabinet is clad in laminated sheet. Dust proof door with lock. The draws are made in teak wood having wood groves each serially numbered, bottom lined with velvet, provided with index card frame and puller knobs. Lever lock to prevent drawer taken accidentally. An extra drawer with index cards. Moisture proof lacquered finish. 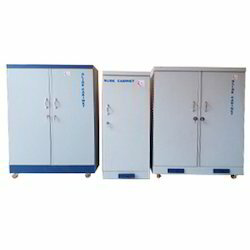 We are a reputed name in the industry, devoted towards offering the best quality array of Slide Cabinet. Slides Cabinet for keeping slides (3" x 1") in vertical position: Made of wood finished with sunmica for capacity of 2000 slides. Similarly we can provide with different capcity. For keeping 75x25mm slides, body made of mild steel sheet well designed for its appearance, performance and durability spry finished with smoothly working doors fitted with handle lock & key. The ABS plastic slide tray for holding slides.